Click here to keep NatureNorth growing strong! Crayfish make excellent Class Room Critters! They are easy to feed and care for, and they are fascinating to watch. They play an important role in aquatic ecosystems as scavengers, cleaning up dead plants and animals for their food. And, in turn, providing food for many other animals. Crayfish are easy to catch. Look for them under rocks or logs in small streams or along the edge of rivers and even in shallow lakes. Go on! You can do it! Get your boots on and head out to your local creek. Minnow traps are another great way to catch crayfish. Lobster traps work on the same principle: a narrow funnel leads into the baited trap -- it's easy to get in, but hard to find the way back out. Just place a bit of meat or fish into the trap (dry dog food works well, too) and place the trap near some underwater structure, such as rocks, a log or footings of a dock. (Technically, to use a minnow trap in Manitoba, you should have a valid fishing license.) Check the trap daily for whatever you may have caught. Just remember to watch those pincers! 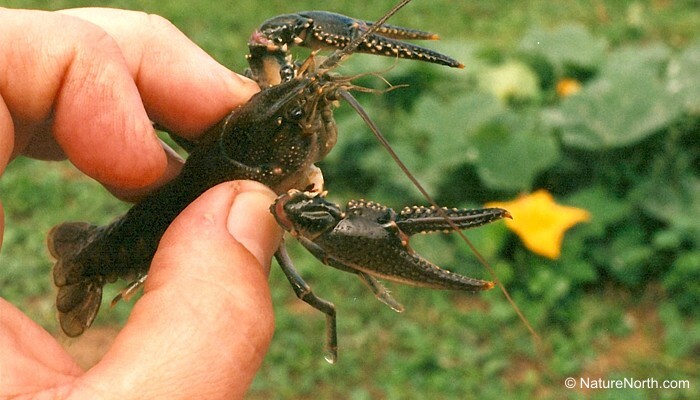 The best way to pick up a crayfish, for your and the crayfish's sake, is to grasp it firmly by the sides of the thorax, just where the chelipeds attach. Apparently, it is now illegal to even possess crayfish in Manitoba. Seems like a little over-the-top response to the Rusty Crayfish situation, but read about it for yourself: Manitoba Conservation Rusty Crayfish page. You can keep your crayfish in an aquarium or large jar. 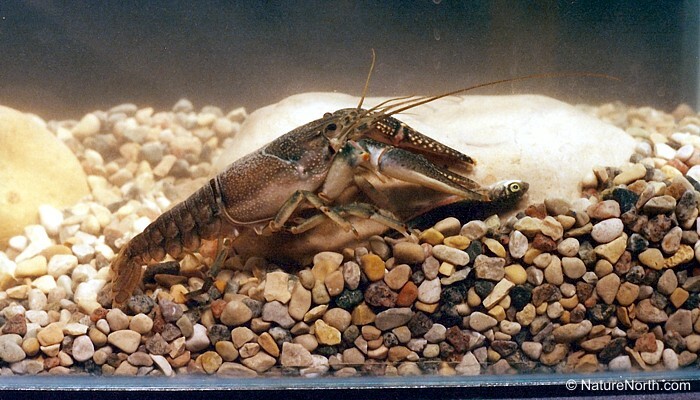 Be sure to keep the water well aerated, if you are planning to keep the crayfish more than a few days. This is more to keep the aquarium water clean and fresh-smelling, than to provide the crayfish with oxygen. They are fairly adept at surviving in water that is low in oxygen. I learned that the hard way when I lost a whole tank full of fish after a pump failed. The fish all died from oxygen deprivation, but the large crayfish in the tank was fine. It's usually best to keep crayfish separately. They are aggressive and cannibalistic towards their own kind, especially if there is a significant size difference. Large crayfish will eat smaller ones! It's OK to have 2 or more together as long as they are nearly the same size. Also, don't put a crayfish into an aquarium with live fish, unless you don't mind the crayfish feeding itself! In the confines of an aquarium, crayfish are pretty good at catching fish. Fish might be safe in an aquarium where they are quite a bit larger than the crayfish, but then the risk might end up being for the crayfish! 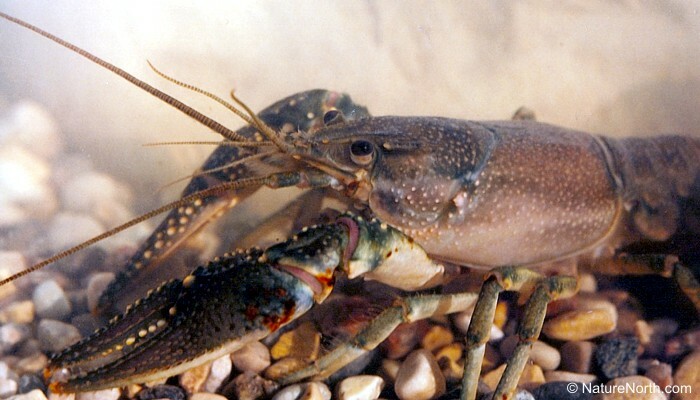 Most fish will be happy to make a meal out of a crayfish, if it will fit in the fish's mouth. 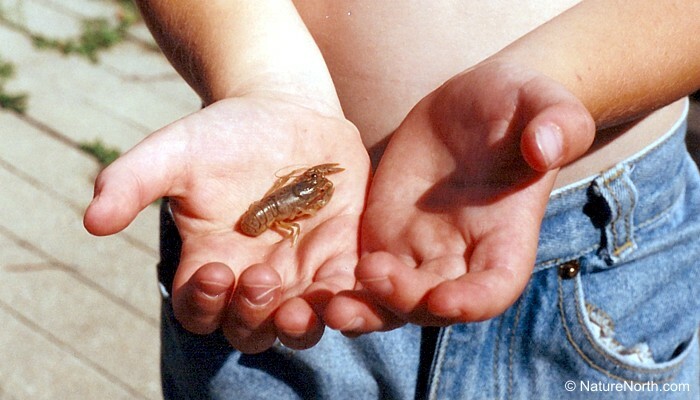 The easiest thing to feed your crayfish is bits of cut-up fish. Buy a small bucket of bait minnows (un-salted!) and you've got enough food for one crayfish for a year! 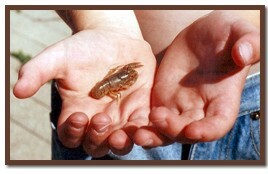 A piece of fish about the size of the crayfish's pincer should be enough food to hold it for a week. When you feed it, spend some time watching how deftly it uses its pincers to hold and tear the food, while using its walking legs (pereopods) to place bits into its mouth. Crayfish are omnivores, though, so they can be fed with a wide variety of things. Pelletized (not flakes) fish-foods are a clean and easy food, as well. Crayfish will probably survive well in a class room aquarium for a long time, but when you do decide to return it to the wild, release it at the same location that you found it. And do so at a time of year when the crayfish still has time to properly adapt back to the wild before winter. Thanks for learning about the Northern Crayfish!